The Archbishop of Canterbury Justin Welby has confirmed that he is the illegitimate son of a one-time private secretary to Winston Churchill, after a newspaper reported the discovery late Friday. Welby, the most senior figure in the Anglican Communion consisting of some 85 million Christians globally, said the news, reported in Saturday’s edition of the Daily Telegraph, had come as a “complete surprise”. But he insisted he was not disturbed by it. “In the last month I have discovered that my biological father is not Gavin Welby but, in fact, the late Sir Anthony Montague Browne. This comes as a complete surprise,” Welby said in a highly unusual statement issued through the Church of England. Welby had assumed that his father was Gavin Welby, a whisky salesman who died in 1977. But the Telegraph said it had found evidence suggesting that Montague Browne was actually his father, a finding it then discussed with Welby who decided to take a DNA test. A comparison between a swab from his mouth and hair samples from Montague Browne, who worked for Churchill between 1952 and 1965, showed a 99.9779 percent probability that they were father and son. 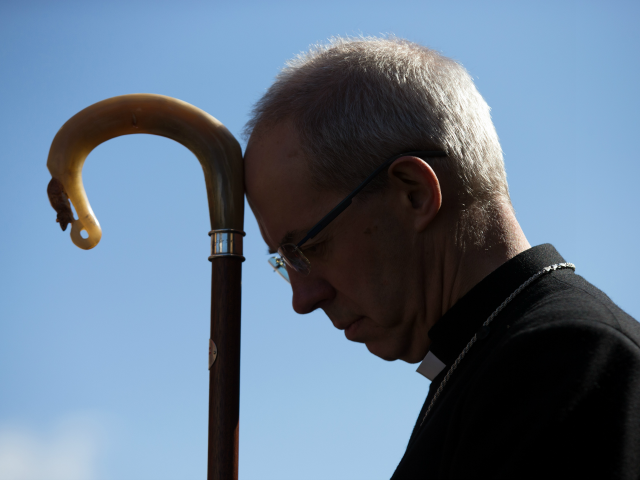 Welby said both his mother Jane and Gavin Welby had been alcoholics, although he stressed that his mother had not drank alcohol for nearly 50 years. “To find that one’s father is other than imagined is not unusual. To be the child of families with great difficulties in relationships, with substance abuse or other matters, is far too normal,” he said in his statement. Welby’s mother Jane also issued a statement saying the news had come as an “almost unbelievable shock”. She confirmed she had slept with Montague Browne shortly before marrying Welby, “fuelled by a large amount of alcohol on both sides”.